Possibly the best controller keyboard in its price bracket, the Launchkey hooks up well with your DAW and its sister iPad apps. Incredible value for money. Keys, pads and buttons are all very solid. Great transport controls. Good connectivity to iPad apps. Pots/sliders feel a bit cheap. Only one slider on 25-key model. Pad backlight limitations in FL studio. 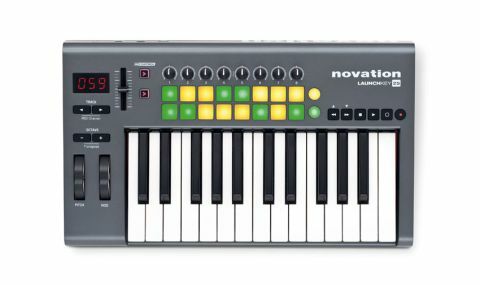 Novation's Launchkey enters the already busy MIDI keyboard controller market that the British manufacturer/developer itself played a major role in defining. Coming in 25-, 49- and 61-key versions (we're reviewing the 25 here), the Launchkey has three headline features intended to elevate it above the crowd: the introduction of Novation's popular Launchpad pads into the control surface, the new InControl auto-mapping system, and direct control of two purpose-built iPad apps. "The build quality of the unit is impressive"
The build quality of the unit is impressive. On top, it's slate grey with a slight shine to it, but the underside is orange. The Launchkey 25 features eight rotary encoders, one slider (you get nine on the 49-/61-keyers), 16 pads (the very same ones featured on Novation's ubiquitous Launchpad), separate mod/pitch wheels, sustain pedal input and 25 semiweighted keys. It connects and draws power from a Mac or PC via USB, or via the Apple Camera Connection Kit when hooked up to the iPad. Although perhaps not the most visually exciting piece of hardware we've ever seen, it's uncluttered and effective, with a sensible layout that shouldn't cause anyone any problems. The keys feel fantastic to play, and the wheels, pads and buttons are pleasingly tactile and of high quality. Sadly, the pots and sliders detract a bit from the feeling of solidity. It's just a minor niggle - they certainly don't feel like they're going to break easily or anything like that - but they do appear to be the cheapest part of the controller. The transport buttons correspond to their equivalents in any DAW (Play, Stop, Record, Fast Forward, Rewind, Loop on/off). These are placed well and worked exactly as advertised when we tested them with FL Studio and Ableton Live. Transport controls on MIDI keyboards are nothing new, but that doesn't mean they shouldn't be commended when they're done well. Nice work, Novation.
" InControl maps the controls to key DAW functions without any setup required"
On top of its 'basic' functionality - i.e., behaving as a generic assignable MIDI controller - the Launchkey features Novation's new InControl system. This maps all of the controls to key DAW functions without any setup required on the part of the user. For example, load up Ableton Live and you can immediately use the pads to launch clips and Scenes, and switch through loaded instruments and effects using the two Track buttons. It just works, with no driver or software installation involved. The pads feature bright LEDs for backlighting. These are multicoloured when the InControl system is working, while when working in basic mode they light up in red only, with their brightness corresponding to the velocity of your hits. Slightly disappointingly, the InControl backlighting doesn't work quite the same in FL Studio, showing up as if you're working in basic mode when you're really not. We assume this will be addressed in a future update, but Novation hasn't actually commented on that. The Launchkey comes with a small lineup of accompanying software and iPad apps. While the V-Station and Bass Station plugin synths are still powerful enough and a useful inclusion for those who don't already have them (they've been bundled with many other Novation products over the years), they're rather long in the tooth now. "There are two accompanying iPad apps, called Launchpad and Launchkey, both free on the App Store"
The iPad apps are a different matter, however. There are two of them, called Launchpad and Launchkey, both free on the App Store, so you don't actually have to own the keyboard to get them, although using it with them does, of course, offer certain advantages. The Launchpad app is a virtual version of Novation's Launchpad controller, offering a grid of virtual pad triggers with which to fire off sampled loops and one-shots. The Launchkey's pads control this well, with the forward/back transport controls switching between rows. However, the onscreen pads in the app itself do just as good a job, so we wouldn't say that using the Launchkey's pads revolutionises this particular experience. One cool thing we'd like to highlight is that you can jump between the two apps seamlessly using the InControl buttons on the keyboard, so you don't have to reach for your iPad to go from triggering loops to laying down synth lines. One final note regarding iPad usage: the keyboard does take its toll on the iPad's battery, of course, unless you plug in a 12v supply. Perhaps the most impressive thing about the Launchkey is its price point. This is a very affordable controller indeed, and even taking into account the cheap feel of the sliders and pots, it represents fantastic value for money and is easily one of the best in its price range. The Launchkey is capable of doing everything that's required to serve as the hands-on centrepiece of any production setup. So whether you're looking for your first MIDI keyboard or in the market for an upgrade from a low-end model, this would be money very well spent.